Can you believe? : "And the Inquisitors sent for us..."
We did write to the Inquisitor, and laid before him our innocency, and our faithfulness, in giving our testimony for the Lord amongst them; and I told him, if it were our blood they did thirst after, they might take it any other way, as well as to smother us in that hot room. So he sent the Fryar, and he took away our Inkhorns, (they had our Bibles before). We asked why they took away our goods? they said, it was all theirs, and our lives, too, if they would. We asked, how we had forfeited our lives unto them; they said, For bringing Books and Papers. We said, if there were any thing in them that was not true, they might write against it. They said, they did scorn to write to fools and asses that did not know true Latine. 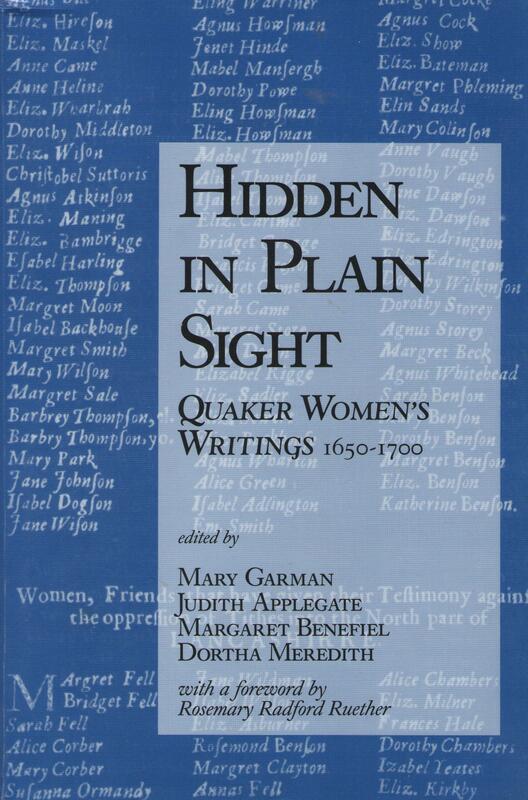 Their powerful, moving account of this imprisonment, and their letters to their families, were included in the collection Hidden in Plain Sight: Quaker Women's Writings 1650-1700, edited by Mary Garman, Judith Applegate, Margaret Benefiel, and Dortha Meredith, published in 1996 by Pendle Hill Publications and available through them or through Amazon. Right now I'm in the midst of an amazing spiritual adventure with these two Friends. After their account was professionally translated into Russian, Natasha Zhuravenkova of Friends House Moscow asked me to go through the original text and the Russian translation to check the accuracy of the translation. Turns out that there is no other way to do this task than to read and re-read and absorb each sentence slowly and deliberately. You probably already realize why this requires such close work: even an excellent English-Russian translator (and Friends House Moscow did find an excellent translator) will have to deal with at least three different sorts of problems: understanding the English and the sometimes idiosyncratic spelling of the mid-17th century; additionally, understanding how Friends spirituality might further affect the way these women wrote; and, finally, finding the right words in Russian to reproduce the voice and era of the original as closely as possible while keeping the translation accessible to the modern reader. I'm only a third of the way through this assignment, and already I have many notes concerning such words as "strait" and "travail" and "joint-meal." For each place where I don't feel certain either about the translation or about my own knowledge, I have to consult at least one dictionary, and sometimes three. 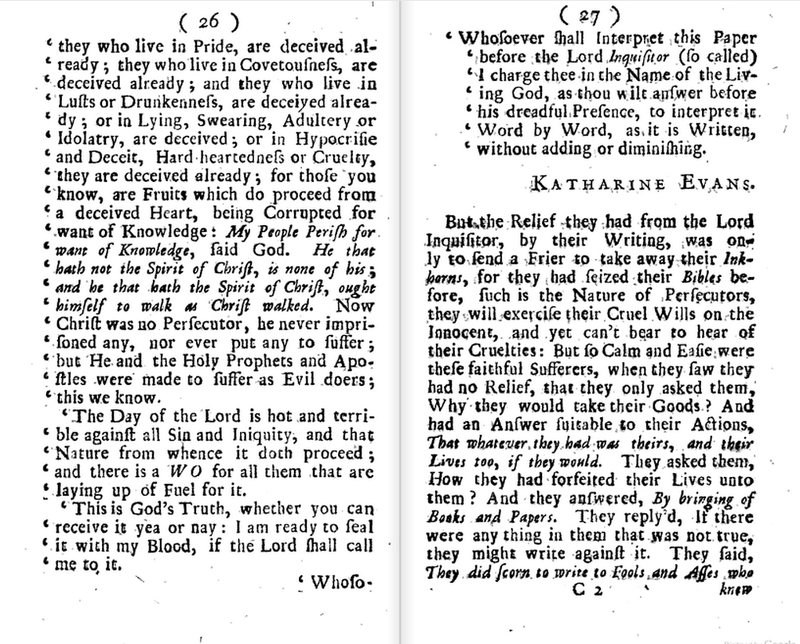 Evans and Chevers are clear that they are under God's direct authority. They pass up any number of chances to exalt George Fox (or to hide behind him). Whatever process back home might have confirmed their mission (and provided for their families in their absence), there is an elemental sense of their having been authorized, empowered, and sent. ... Blessing and honour and Glory be given to our Lord God for ever ... who hath counted us worthy, and hath chosen us among his faithfull ones, to bear his name and to witness forth his truth, before the high and mighty men of the earth, and to fight the Lords battle with his spirituall weapons, to the breaking down of strong holds, high lofty looks and vain imaginations, and spirituall wickedness in high places. And, likewise, their answers to their interrogators are clear and direct. It rubs a bit against the modern ecumenical/interfaith spirit to see them put their demands for repentance so directly and persistently, but they were not about to back down. They said, The Pope was Christ's Vicar, and we were of his Church, and what he did, was for the good of our souls. We answered, The Lord had not committed the charge of our souls to the Pope, nor to them; for he had taken them into his own possession, glory was to his Name for ever. They said, We must be obedient. We said, We were (obedient) to the Government of Christ's Spirit. Another thing that struck me: Evans and Chevers are ministers of God, not spokespeople for a sect. They are pleading for what they consider a wholly adequate manifestation of Christianity, not a precious little bundle of peculiarities. Their challenges to their persecutors are undergirded by Scripture and not by reference to Quaker writings or a list of testimonies. They mention that there are thousands of others back home who believe and practice as they do, but on Malta these women are calling for repentance, conversion, and Christian consistency, not for affiliation to an organization. 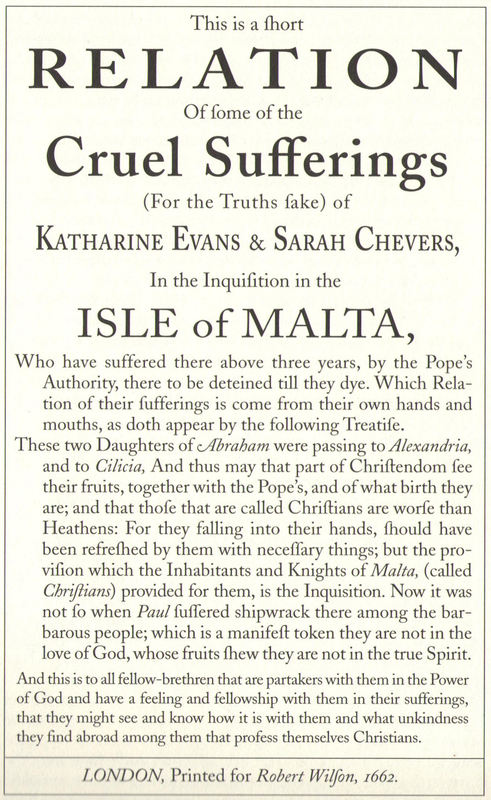 With bitter humor, the cover of their booklet points out the contrast between their ill-treatment and the experience of Paul among the "barbarous" people whom Paul encountered when shipwrecked upon Malta. We said, we had thousands at our meetings, but none (of us) dare speak a word, but as they are eternally moved of the Lord; and we had Miracles, the Blind receive their sight, the Deaf do hear, and the Dumb do speak, the Poor do receive the Gospel, the Lame do walk, and the Dead are raised. Are there whole new queries that arise for us from this testimony? Moscow Friend Sasha Gorbenko's labor of love, a history of Friends in Russian, is now online--or at least the first part is. An edited version has just been published in the Russian Orthodox Church's Orthodox Encyclopedia (but not yet available online). "The Public Atheists Refute an Imaginary God" (Frederica Mathewes-Green) but don't dismiss the God concepts of naive faith too quickly. Christianity Today's Alissa Wilkinson gives a thoughtful explanation: "Why We Review R-Rated Films." "Sing Out! Mourns the Passing of Pete Seeger." So does the Guardian: "Authentically America." So does RIA Novosti (in Russian), with special accent on Pete's musical links with Russia. Is Russia's "optimistic" TV channel, Dozhd ("Rain") about to be politically throttled? Photo: Our friend Sergei Nikitin appears on Dozhd today, along with two other Amnesty International colleagues--from Ukraine and the Netherlands. Follow this link to see the interview on Dozhd's site. Joan Osborne and the Holmes Brothers end my evening at the computer on a good note. "Evans and Chevers are ministers of God, not spokespeople for a sect."